Scale 1/1 There are 16 products. 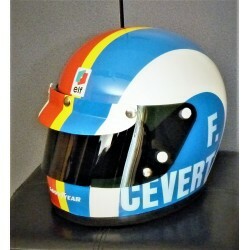 François Cevert / Tyrrell replica helmet. Manufactured with an authentic helmet from the 70s. With SNELL 1970 label inside. 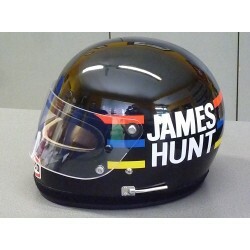 One off - only 1 helmet available ! 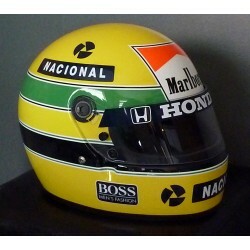 1987 Ayrton Senna used look replica helmet. Ayrton used this colour scheme during the 1987 Jacarepagua GP and during Test sessions at the same track early in 1987. The replica is made with an authentic BELL XFM-1 helmet from 1987 and comes with radio. 1988 Ayrton Senna / McLaren Honda replica helmet. 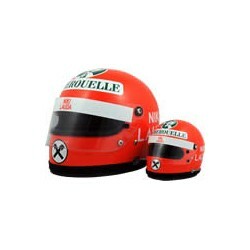 This replica is realized with a BELL XFM-1 helmet, the same type of helmet as Ayrton used in 1988. Very limited edition. 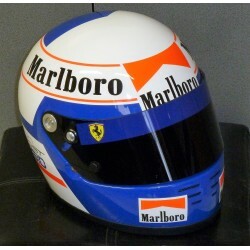 This helmet is FIA SNELL 2010 homologated and comes with full MARLBORO branding. 1988 Ayrton Senna / Camel Lotus replica helmet. 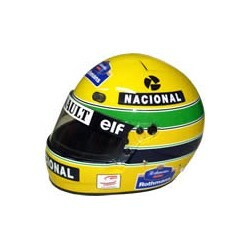 This replica is realized with a BELL XFM-1 helmet, the same type of helmet that Ayrton used in 1988. FIA SNELL 2010 homologated and supplied with CAMEL branding. 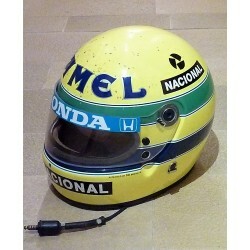 1994 Ayrton Senna BELL replica helmet, FIA homologated. 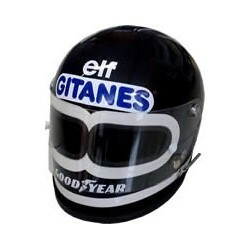 This helmet comes with ROTHMANS branding. 1990 Alain Prost / Ferrari replica helmet. Made with a genuine ARAI race service helmet. Superb finish. This 2 eye replica helmet is realised on a real BELL Star helmet and it still wears the SNELL 1975 label inside !